Our Thanksgiving dinner was a departure from the usual. 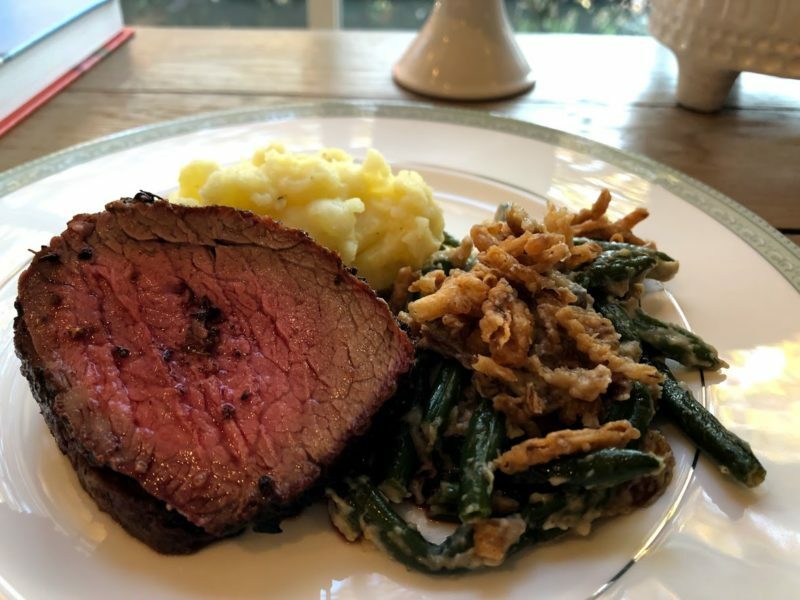 Our Son Michael loves to grill and decided to attempt a whole tenderloin cooked over indirect heat and then seared over the direct coals. The inspiration came from Meathead Goldwyn in his iconic grilling book Meathead; The Science of Great Barbecue and Grilling. The beef was outstanding. Served with mashed potatoes and an updated green bean casserole, we never even missed a turkey. 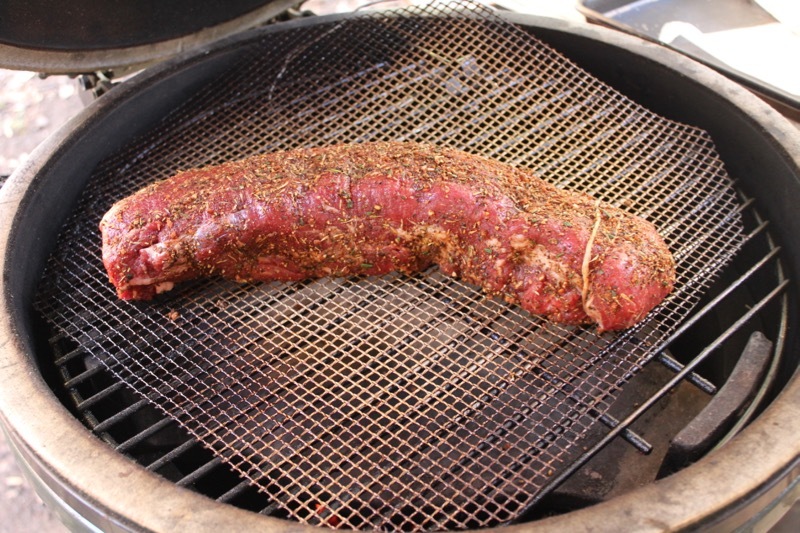 A whole tenderloin requires a breakdown to get to a symmetrical log from the center. The tenderloin tips are cut from each end. The chain along the side needs to be trimmed away and the silverskin removed. 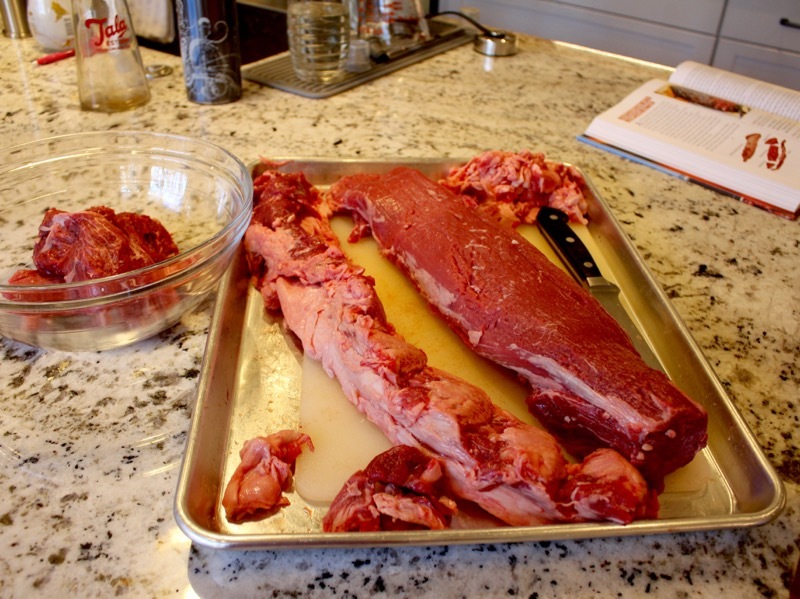 The trimmings can be used as a few filet mignon steaks, stew meat, and/or ground with some of the fat into upscale hamburgers. You will need to fold over the tapered end and tie it with string to ensure even cooking. 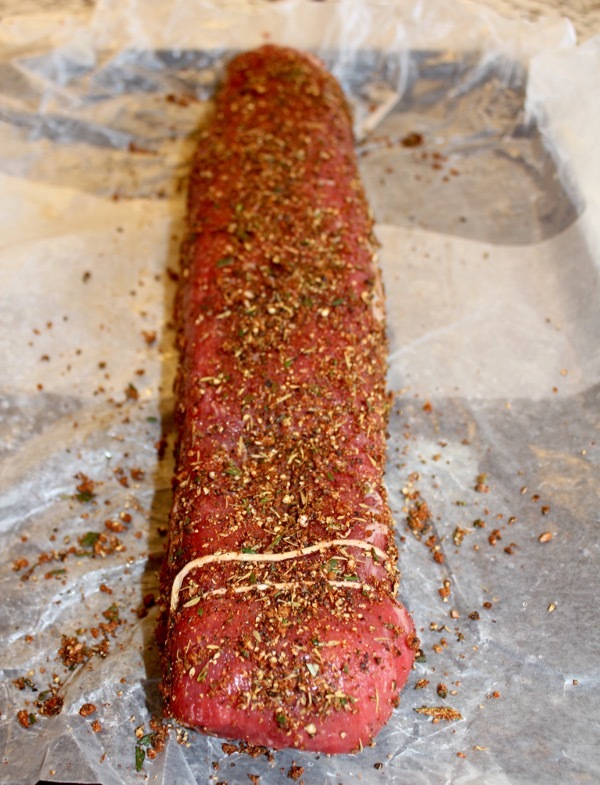 Once the chateaubriand is ready, dry brine it in the refrigerator for 4 to 6 hours. The dry brine is just kosher salt. Sprinkle about 1/2 teaspoon of salt per pound of meat all over the cylinder. 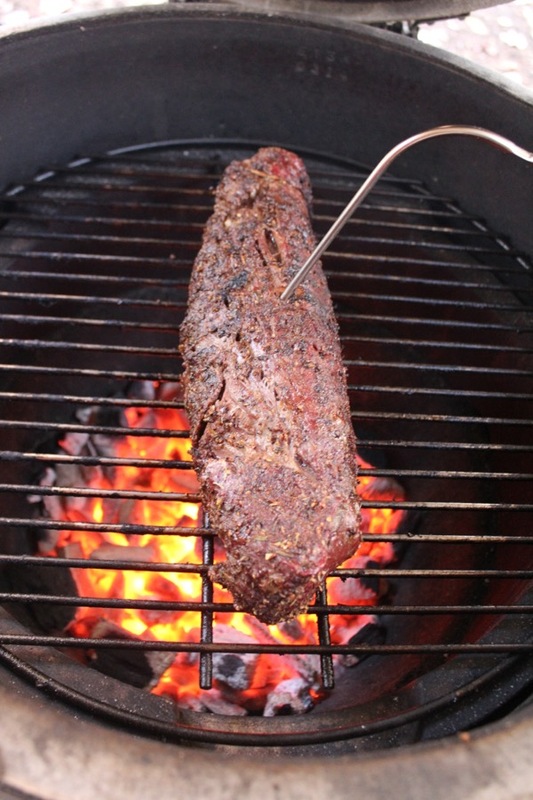 After the allotted time is up, remove the beef from the refrigerator and season it with a seasoning rub. Set up the grill in a two-zone configuration and get the indirect zone up to about 225 degrees F. Place the meat in the indirect-heat zone. It will cook slowly for about 45 minutes. Check temperature with a meat thermometer. When the meat reaches 110 degrees F, move it to direct heat to sear. Leave the lid open and roll the roast a quarter turn every 5 minutes or so. When it reaches 130 degrees F in the center, move it to a cutting board. Cover with foil and let rest for 15 minutes or so. Slice into at least 1 inch steaks and serve. Serves 6 to 8 easily. 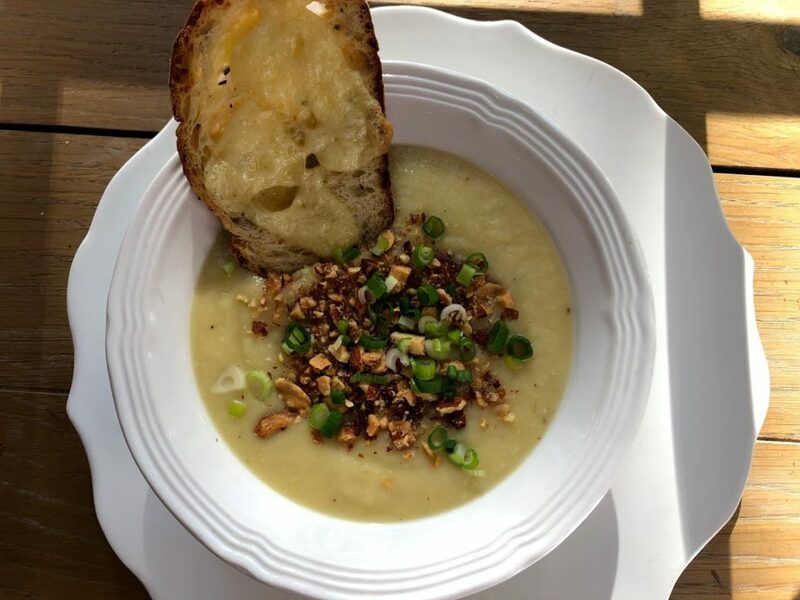 Earlier in the day Kristen made a delicious Parsnip and apple soup with smoked almonds and scallions. I don’t have the recipe but anything you add to it is enhanced by using an immersion blender to meld it all together. Here is a similar recipe. 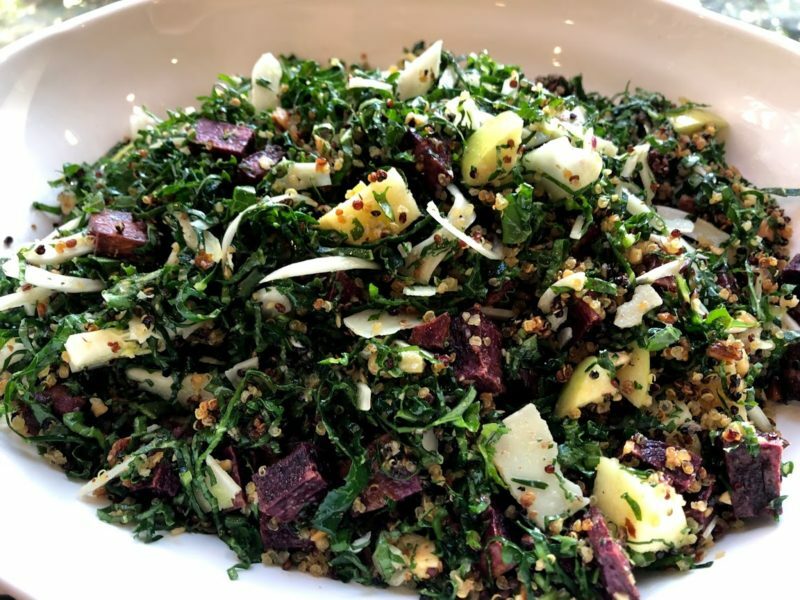 One of the most colorful dishes on our table was this fabulous Kale, roasted quinoa, purple sweet potato and apple salad. It was such a seasonal delight that I would love to serve this every Autumn and Thanksgiving. Kristen is so creative. Remind me to get the recipe. Will try to blog about this again or maybe Kristen will put it on her blog, Menubility. I made a Bourbon Pumpkin Pie from this recipe. I add a Streusal Topping. Recipe follows. Mix all ingredients. Place on a baking sheet and bake for about 15 minutes in a 350 degree oven. Cool and sprinkle over cooked and cooled pie. You will have extra for other purposes. We took some time over Thanksgiving to have photos taken for our Christmas cards. We are lucky to have Christobal of Azul Photography as a family friend. Let the Christmas Season begin. Posted on November 27, 2018 at 2:09 pm. It all started innocently. Hikers climbed to Party Rock on the mountain behind our home on November 5th. Neighbors heard young people hooting upon arriving at the pinnacle. 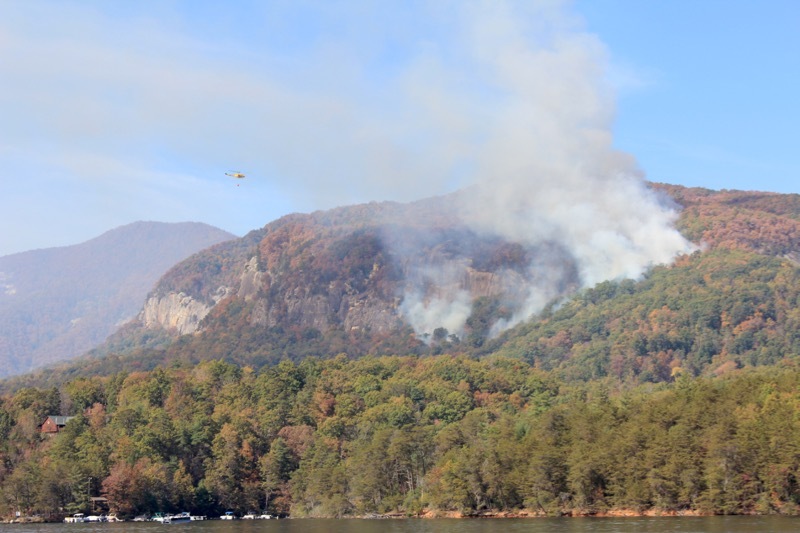 Shortly thereafter smoke started billowing down the mountain. It was just a small fire. The next day helicopters starting buzzing our house. 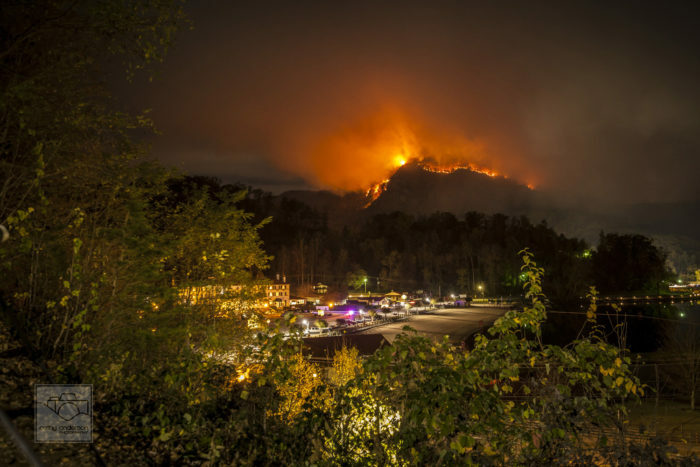 The fire had spread and they were scooping water from the lake and transporting it to the top of the mountain and dumping it on the blaze. Notice the helicopter in this photo. We were out on the lake when all of this was happening. The helicopter is coming in for another scoop of water in this picture. We thought it would be under control in no time. It was not to be. 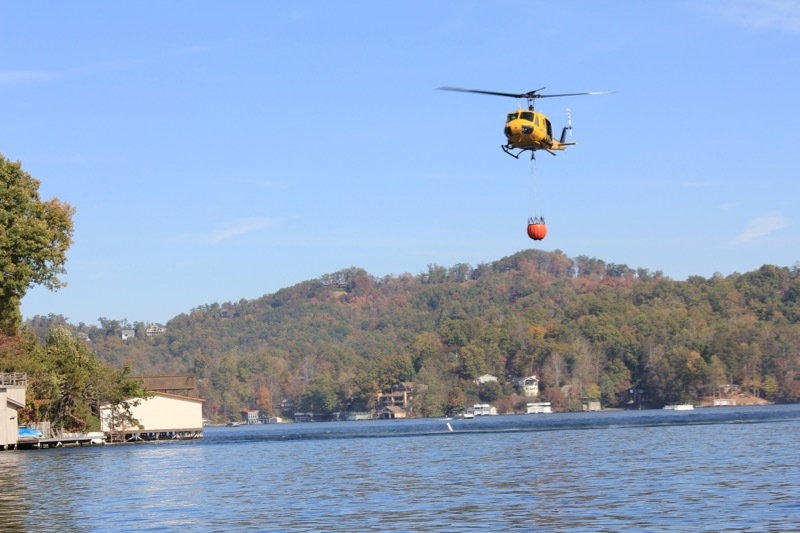 The fire went from a few acres to over 4000 acres over the next week. Winds had picked up and the fire spread both east and west along the ridge line. Evacuations were ordered. We were told to leave. What do you take when told to evacuate? It was a harrowing experience. 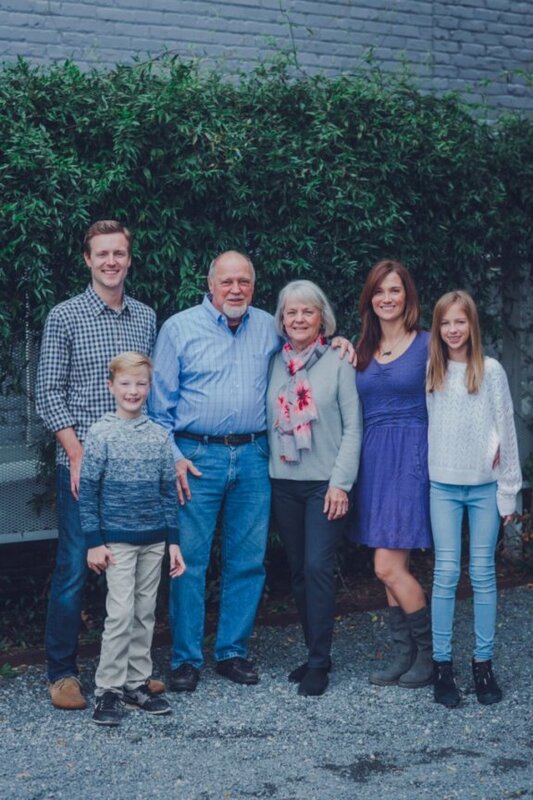 We gathered clothes, medications, files, paintings, family photos and David’s favorite wine collection in our two cars and left with our dog Daisy. 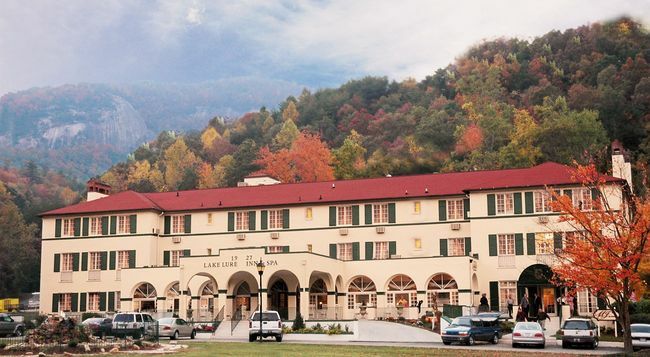 We went a few miles across the lake to The Lake Lure Inn and Spa. They were accepting refugees from our side of the lake and had reduced the rate to well below half of what they would normally charge. We spent three days here with our neighbors and eventual friends. The only silver lining in this story is how wonderful it was to meet and spend time with our neighbors. We had communal meals in the Moose and Goose Lounge every night while we were there. Everyone was displaced and worried, but we managed to make the best of it. On the fourth day of the evacuation David and I moved to a cabin owned by good friends Tom and Diana. They live out of the state so the cabin was available. It was just the respite that we needed. I was able to cook a few meals; spaghetti and this soup. We relaxed with good books and the stillness of the isolated woods surrounding us. The evacuation notice was lifted the next day and we returned home. With over 700 firefighters battling the blazes, our small area was declared safe. Our air quality is not great but our home is safe. We are thankful. The fire may burn for another few weeks, but with the dedicated fire crews we feel that we will get through this. So . . . I am back in my kitchen. As part of the blog posts that I promised on Thanksgiving side dishes, I made this Broccoli Wild Rice Casserole. 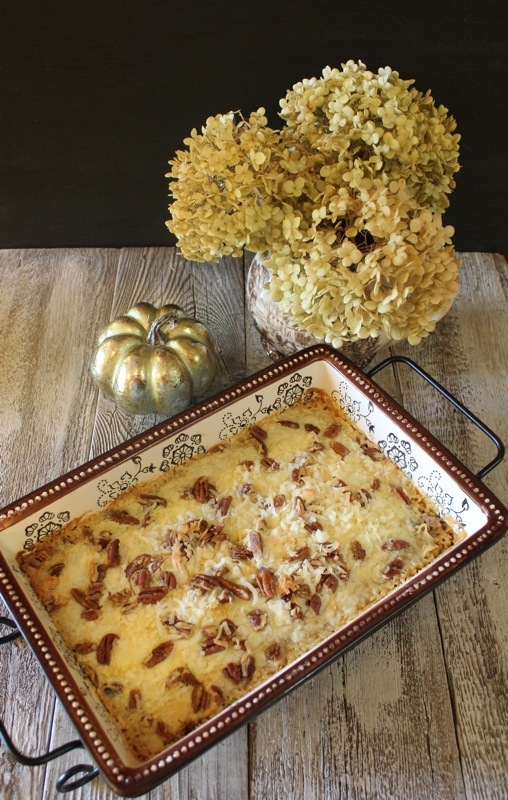 The recipe comes from the Pioneer Woman who can be relied upon to offer great recipes. There are several steps involved in making this, but it all comes together easily and can be prepared ahead of time. Just slip it into the oven an hour before your meal. 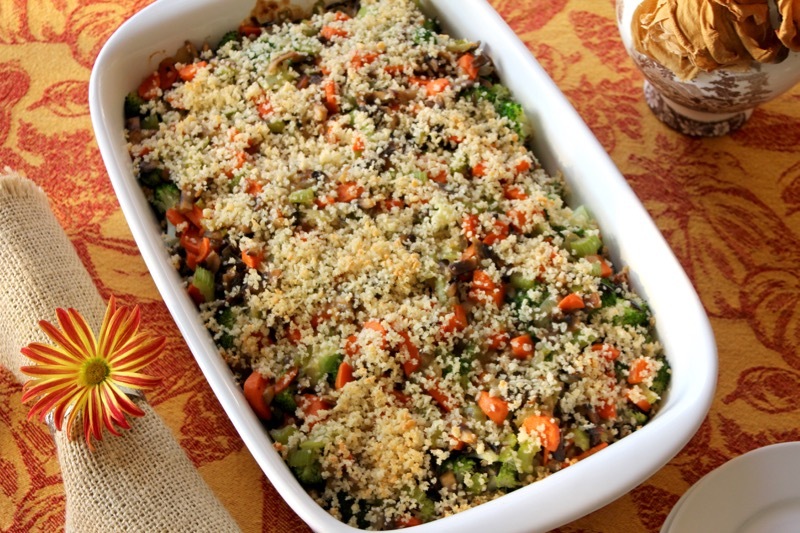 It has lots of broccoli, mushrooms, carrots, celery and wild rice with a thickened sauce of chicken broth and cream. Thanksgiving this year brings much more to be thankful for than I have ever expected. I halved this recipe for just the two of us, except for the carrots and celery. Recipe as written is for the full amount. Posted on November 17, 2016 at 9:16 am. There are many things to love about Thanksgiving. One of my favorite things is the delicious side dishes. No matter what you do to the turkey, it is still boring in my book. But the sides can shine and make your table sparkle with vivid colors of orange in the sweet potatoes, red in the cranberry relish, and glistening green in beans or salads. I love the idea of combining white and sweet potatoes. 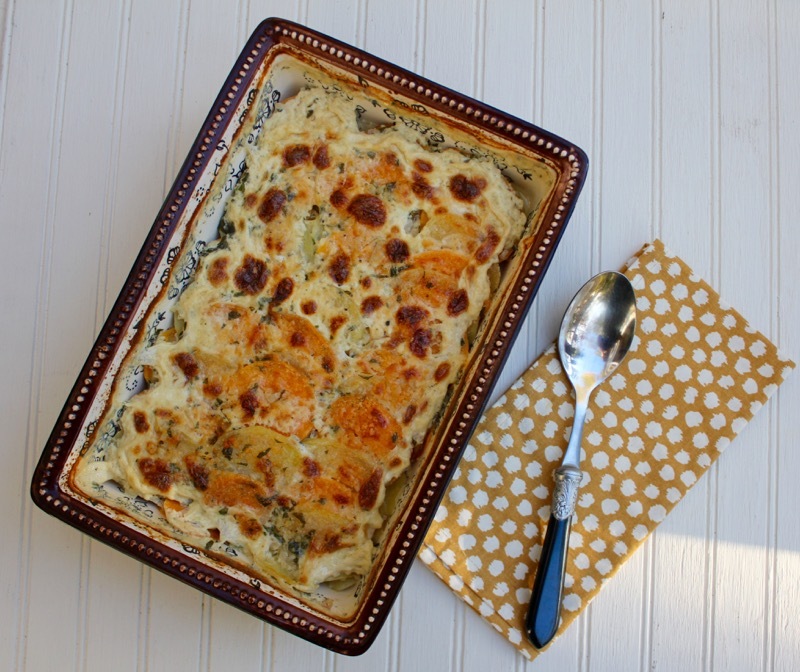 This layered gratin can be partially made ahead which makes it a good side dish for Thanksgiving. 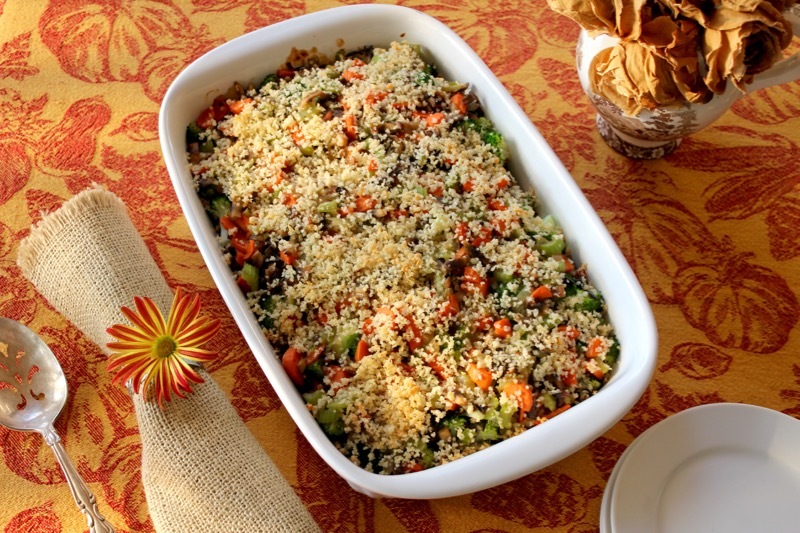 It also travels well if you are bringing a side dish to a hostess’s table. 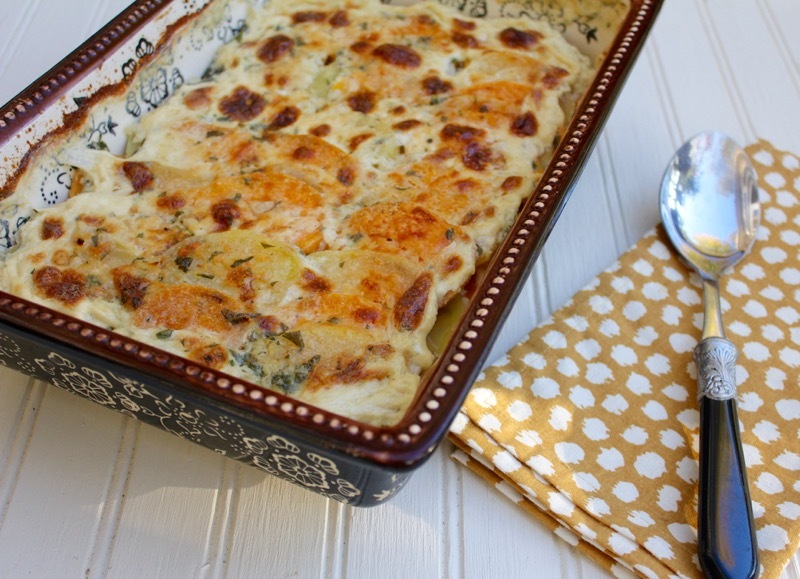 This gratin is rich with shallots, Gruyere cheese, and cream. 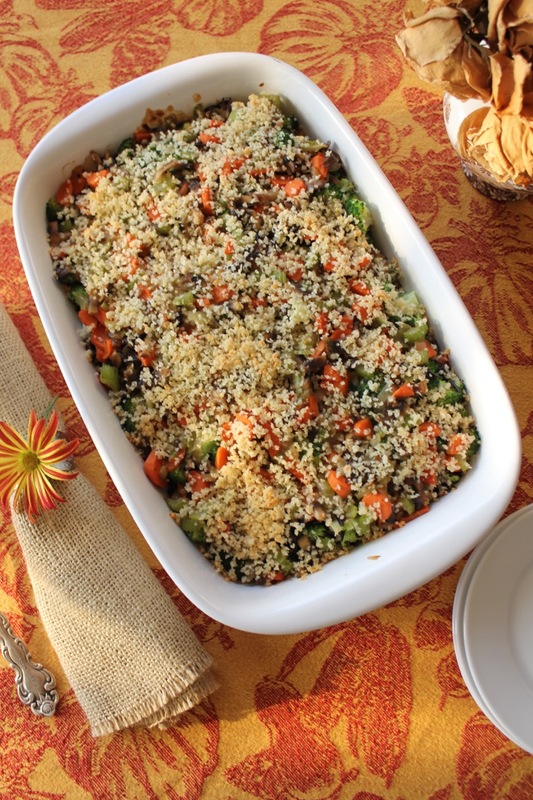 Over the next few weeks I hope to post some more ideas for Thanksgiving side dishes. We will be traveling for Thanksgiving, so hopefully a few of them may show up on our host’s table. 1. Preheat oven to 375°. Sauté shallots in 3 Tbsp. melted butter in a saucepan over medium heat 2 minutes. Stir in cream and next 5 ingredients; cook 2 minutes. Remove from heat; cool 15 minutes. 2. Meanwhile, peel and thinly slice all potatoes. Combine sliced potatoes and milk in a large, microwave-safe bowl. Cover with plastic wrap, and microwave at HIGH 5 minutes. Uncover and gently stir mixture. Re-cover and microwave 5 more minutes. Drain mixture, discarding milk. 3. Layer one-third of Yukon gold potatoes in a well-greased (with butter) 9- x 13-inch baking dish; top with one-third of sweet potatoes. 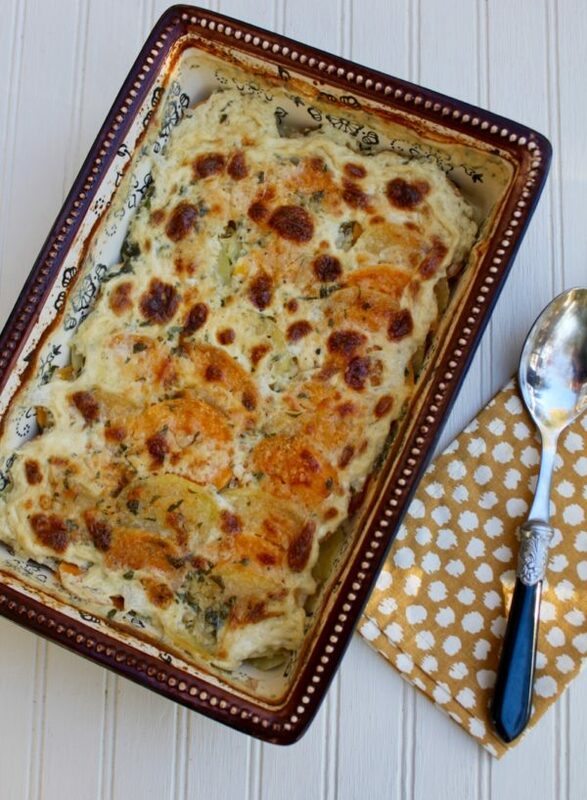 Spoon one-third of cream mixture over potatoes, and sprinkle with 1/2 cup Gruyère cheese. Repeat layers twice, and top with Parmesan cheese. Cut remaining 1 Tbsp. butter into small pieces, and dot over top. Cover with foil. 4. Bake at 375° for 30 minutes. Uncover; bake 20 minutes or until browned. Let stand 10 minutes. Posted on November 10, 2016 at 7:49 am. 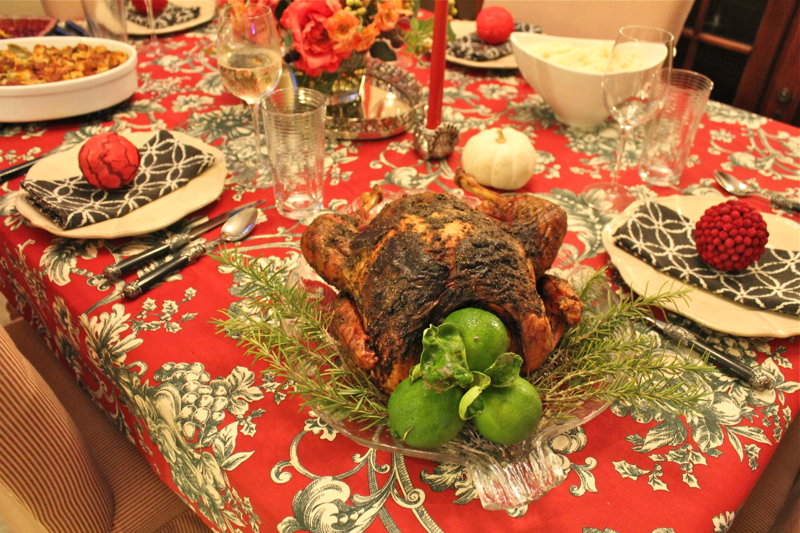 With Thanksgiving approaching, I wanted to share a few dishes that have been on my table and on my blog in the past years. These are recipes that have worked well for me and I am sure they will add a special punch to your usual menu. Notice that I am not including a recipe for turkey. I would not presume to tell you how to cook your turkey. Everyone has their personal idea of the best way to do that. Let’s start with appetizers. 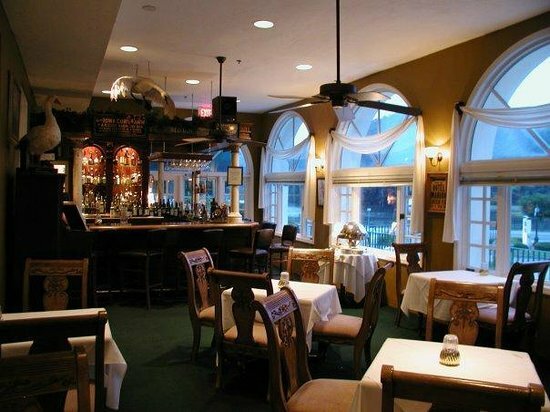 Because there is a huge meal waiting in the kitchen, appetizers should be light. 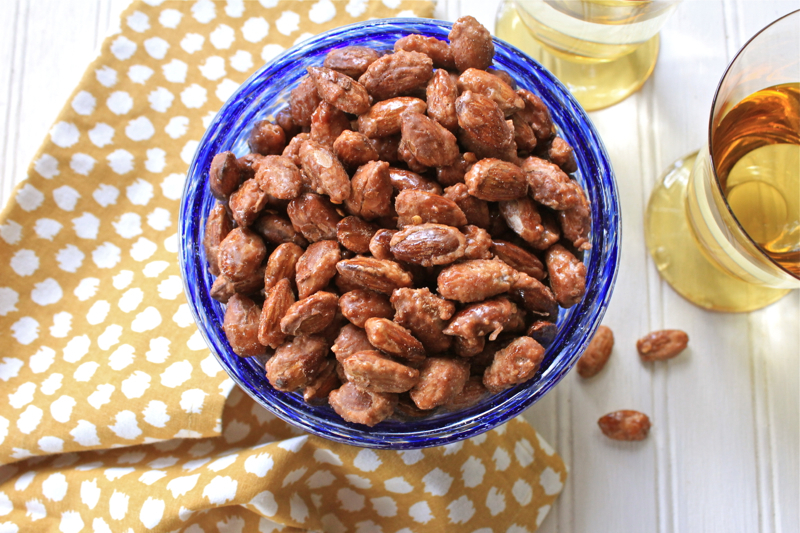 These Candied Spiced Almonds require a little attention upfront, but can be made way in advance. I always love homemade savory shortbread crackers and the addition of dried cranberries to these appetizer rounds make them perfect for the holidays. 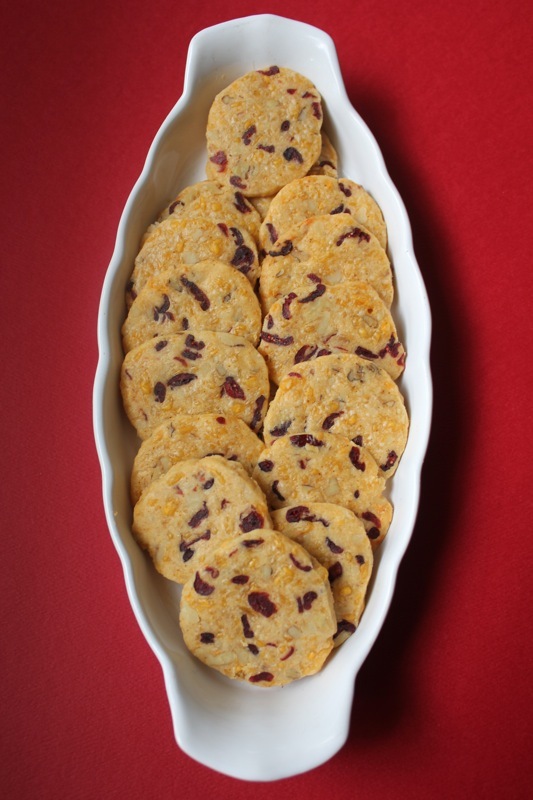 The recipe for these Chipotle Cheddar Cranberry Nut Wafers can be found here. 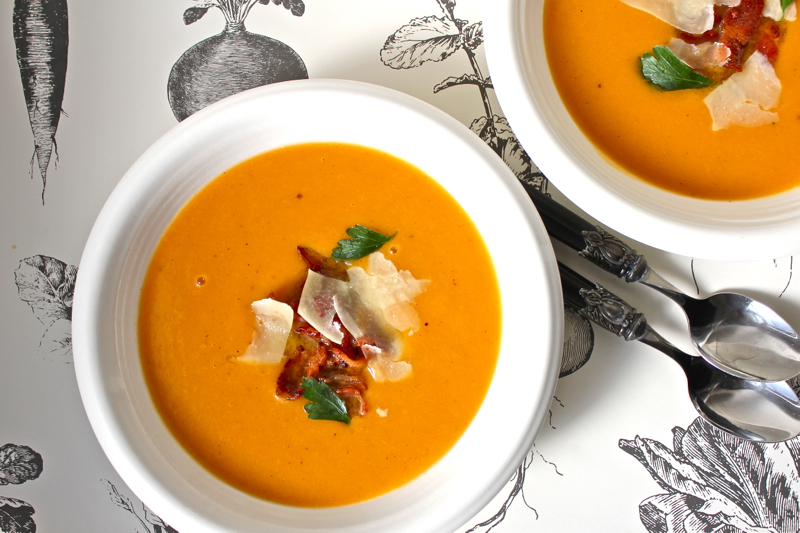 If you prefer your sweet potatoes as a first course, this Creamy Sweet Potato Soup is sure to be a hit. It is easy too. The sweet potatoes are cooked in the microwave and the mixture comes together smoothly with an immersion blender, although you could puree it in a blender or food processor. 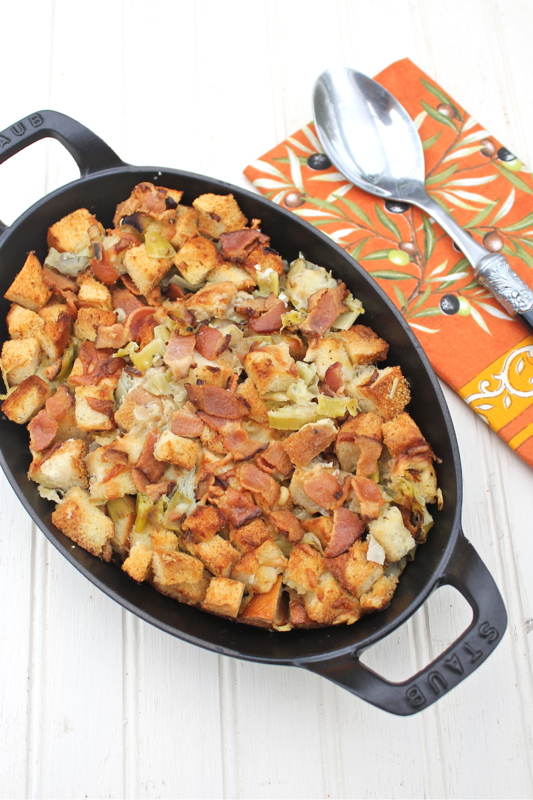 Leek and Artichoke Bread Pudding makes a great dressing if you do not stuff your bird. It is an Ina Garten recipe and you can make it ahead of time. Bacon can be substituted for the pancetta or you can leave it out all together if you have vegetarians at the table. 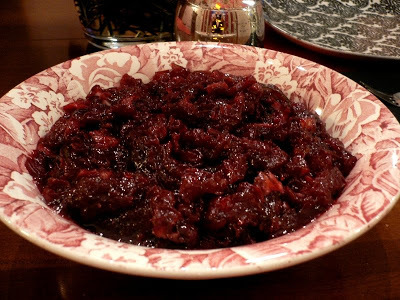 This Cranberry-Lime Chutney is definitely a new take on cranberry sauce. 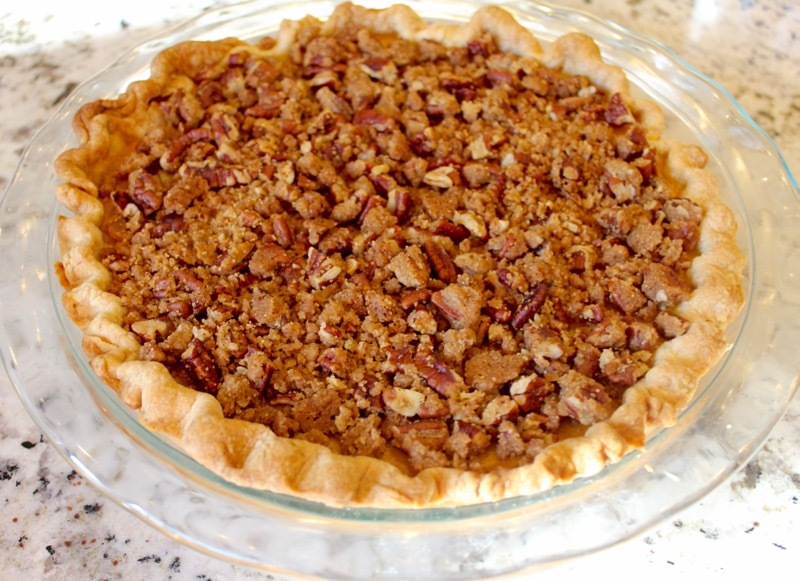 It is a combination of fresh cranberries, lime, apples, onion, raisins, pecans, and lots of spices. It is best made ahead of time. Instead of a green bean casserole, try these Green Beans Gremolata. 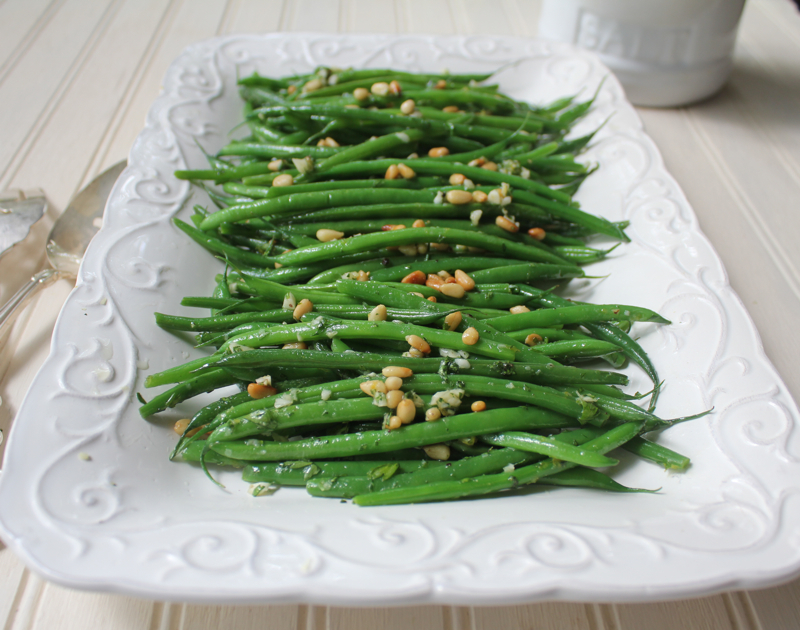 This dish is best made with the thin French Haricot Vert. They have been readily available in several supermarkets that I visit. They are usually found in a cellophane bag. The beans are cooked quickly and then tossed in a mixture of garlic, parsley, parmesan and pine nuts. 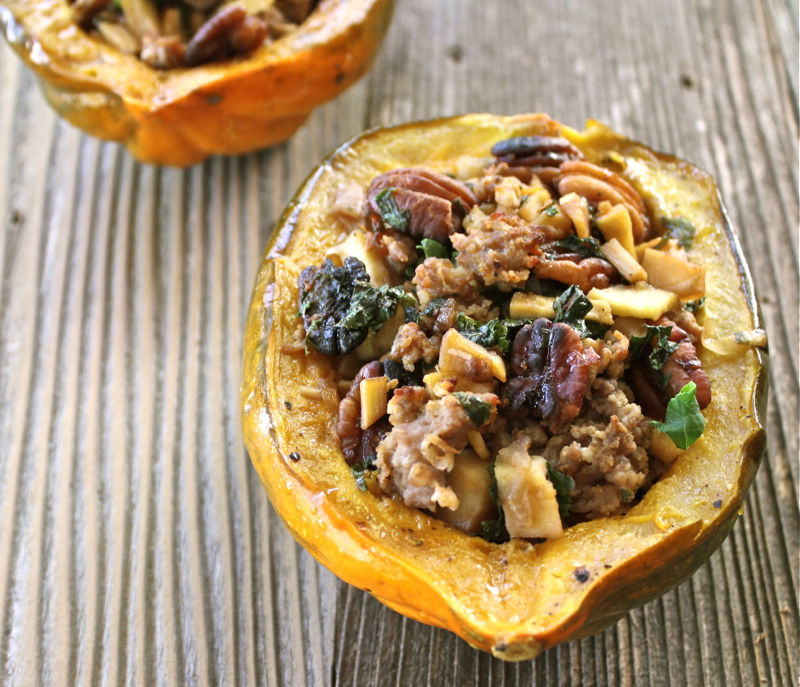 This Maple Glazed Acorn Squash with Sausage, Apple and Sage could almost be a meal on its own. But it would certainly look pretty on the Thanksgiving table. 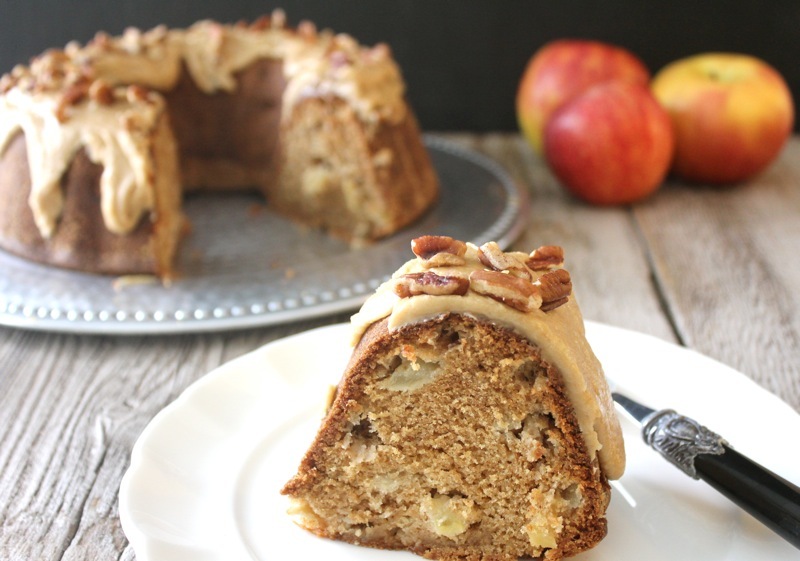 Instead of an apple pie you could make an Apple Bundt Cake. This spice cake with a caramel frosting is a snap to make and there is a good tip on how to turn your cake out of the bundt pan easily. If you are in a hurry you could make this Pumpkin Dump Cake. For a while this cake was on my DIL’s family Thanksgiving table every year. I first made it for Kristen for her birthday and she loved it so much that she shared it with her family. They adopted it for Thanksgiving. 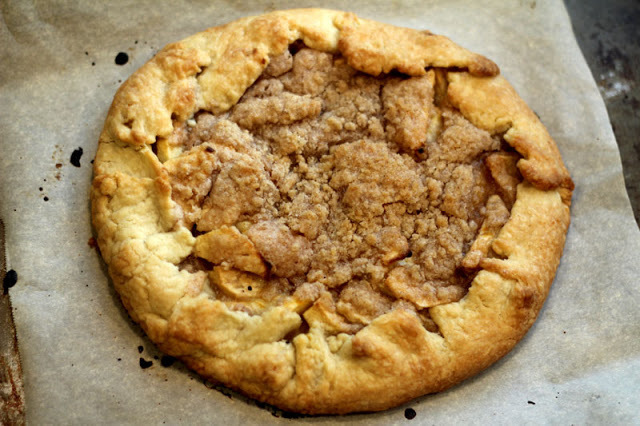 Instead of that apple pie you could make this free form Apple Crostata. This is one of my favorite desserts. Enjoy the preparations and fun of the Thanksgiving holiday. Posted on November 16, 2015 at 7:45 am. It is the start of the holiday season. 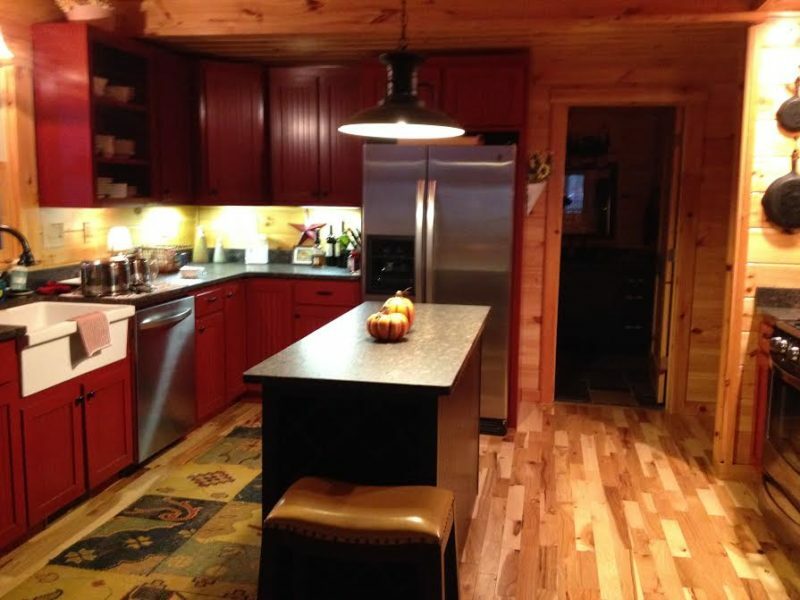 With the approach of Thanksgiving our kitchens will become steamy, aromatic and warm until we sprawl exhausted on our sofas on New Years Day vowing never to eat again. But for foodies it is the best of times. The Thanksgiving feast is just the warm up. We have done something a little different this year. We have already had our Thanksgiving dinner. We will not be with family and friends this year so we decided to travel on the Thanksgiving weekend. We are going to Savannah to take in the historic downtown area. So David and I cooked a simple Thanksgiving meal for the two of us this weekend. David was in charge of the turkey. 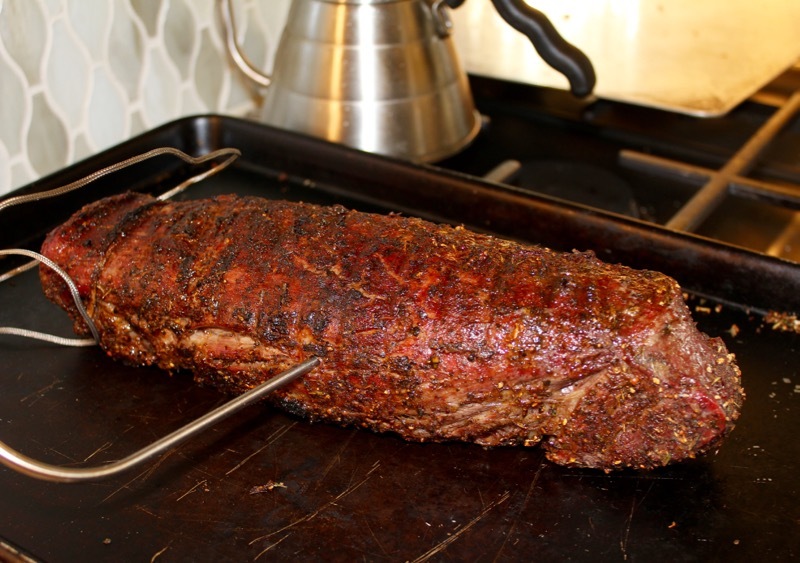 He smoked it on the grill and I will let him tell you about it at the end of this post. I did all of the side dishes. A new one for me this year was this Leek and Artichoke Bread Pudding from Ina Garten’s new cookbook, Make it Ahead. How perfect is that? 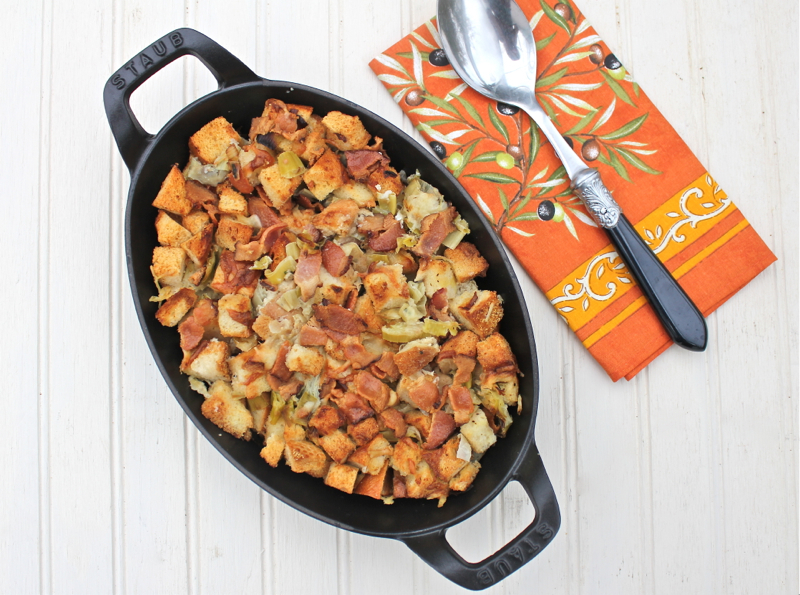 Instead of my standard dressing, this savory bread pudding hit all of the marks in my book. I have an affinity for leeks and artichokes and the fact that it can be made ahead of time is a real timesaver at Thanksgiving. You will love the combination of flavors with the salty pancetta on the top and the creamy base. We found it to be a great alternative. Here is our intimate Thanksgiving table. David laughed at me for the care that I took dressing the table. It is a bit over the top, but I enjoyed having the leisure to make it special. I have to say that everything was delicious. The meal included David’s moist smoked turkey, his special gravy, mashed potatoes, my Mother’s cheesy green beans with bacon, Ina’s leek and artichoke bread pudding and Sam’s (My Carolina Kitchen) French cranberry sauce. I am turning it over to David so that he can tell you about his turkey and gravy. I (David) have been wanting to smoke a turkey for a long time, but Penny would never let me do it for Thanksgiving when we would normally have guests for dinner, fearing that I might muck it up and she would not have a decent bird to serve to company. (Penny here, plus no gravy). I told her about a week ago that I planned to smoke a turkey for myself for the fun of it and she could eat some if she liked it….or not. My plan was simple, to have smoked turkey and a couple of appropriate sides for a normal Saturday night supper, but my simple plan somehow morphed into the table that you see above. That’s what being married to a food blogger will do for you. 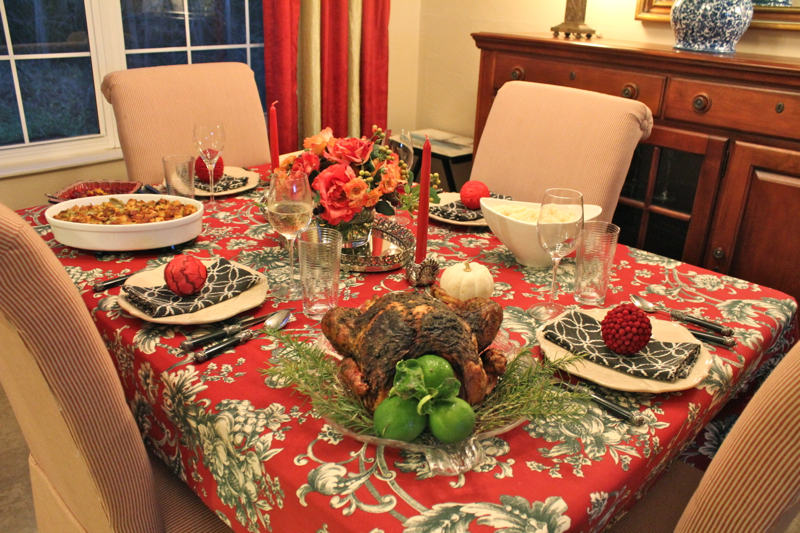 I did get a good chuckle out of the elaborate table setting for a two-person, not-quite-Thanksgiving meal. Anyway, I got to smoke my turkey. As some of you know, I have a Kamado ceramic egg style grill back in Lake Lure, but not down here in Florida, so I was faced with cooking it on the gas grill that I have here. After Googling “smoked turkey recipe” and reading about several candidate techniques, I zeroed in on Meathead Goldwyn’s method as spelled out in excruciating detail on his most excellent website Amazing Ribs. He’s the go-to guy for all things barbecue. You can take a look at his website for the gory details, all 42 printed pages of it, but suffice it to say that his techniques are based on the science of cooking meat, including the underlying thermodynamic and heat transfer principles, which greatly appeals to me, this retired thermodynamics professor. In short, you coat the bird with his “Simon and Garfunkel” rub (I bet you can guess the main ingredients) both under and over the skin. Then you set up your grill for indirect cooking with the bird on one side over an aluminum roasting pan filled with chopped-up onions, carrots, and celery, along with the turkey neck, heart, gizzards, wing tips, and “Pope’s Nose”, some herbs and spices, and about three quarts of liquid. I used two quarts of water, a bottle of white wine, and a cup of apple juice. The liquid left in this pan at the end of cooking, and after straining out all the solids, is the “gravy” you can serve with the meat without the bother of thickening it with flour. Use the burners on the other side of the gas grill for supplying the heat to produce smoke from a couple of chunks of foil-wrapped wood (I used cherry) and to keep the turkey side of the grill at around 325F as measured with a digital thermometer at rack height. Our ten-pound bird took about 2 hours to reach the target temperature of 160F in the thickest part of the breast, at which time the temperature of the thighs was 170F….perfect. During a 15 minute rest period the temperature at both locations will increase about 5 degrees. The result is a juicy bird with crisp skin and a nice mellow smokey flavor and some delicious broth to go with it. If you decide to try this, you should definitely take a look at the Amazing Ribs website for details. That is all from the two of us. We wish everyone a bountiful Thanksgiving. We are thankful for all of you. Place the bread cubes on a sheet pan and bake for 15 minutes, tossing once, until lightly browned. Place the pancetta in on layer on another sheet pan and bake in the same oven for 15 to 20 minutes, until lightly browned. Place the pancetta on a plate lined with paper towels and set aside. Meanwhile, soak the leeks in water until they’re clean, and spin them dry in a salad spinner. Heat the butter in an 11-inch pot over medium heat, add the leeks, and cook for 10 minutes, stirring occasionally. Add the wine, 1 teaspoon salt, and 1 teaspoon pepper and cook for 5 minutes, until the wine almost evaporates and the leeks are tender. Of the heat, mix in the artichokes, toasted bread cubs, chives, and tarragon. Whisk the eggs, cream chicken stock, nutmeg, and 1 teaspoon salt together in a large bowl. Spoon half of the bread mixture into a 13 x 9 x 2-inch baking dish. Sprinkle with half the Emmentaler and add the remaining bread mixture. Pour on the cream mixture, sprinkle with the remaining Emmentaler, and press lightly to help the bread absorb the liquid. Dice or crumble the pancetta, scatter on top, and sprinkle lightly with pepper. Set aside at room temperature for 30 minutes to allow the bread to absorb the cream mixture. Bake for 45 to 50 minutes. until the pudding is puffed and golden. Make it Ahead: Assemble the bread pudding and refrigerate for up to 2 days. Bake before serving. Posted on November 24, 2014 at 7:46 am.